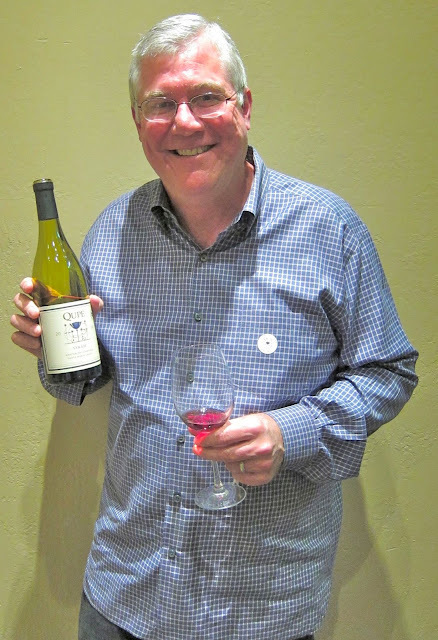 Qupé winemaker Bob Lindquist has been making Rhone variety wines in Santa Barbara County for 30 years. He was making Syrah when it was on its way up here, and is still making it now that he, like everyone else, can't sell it. Recently he held a lunch where, in addition to plenty of older vintages, he introduced MaxTap, a blend of Syrah, Grenache, Tempranillo and Mourvedre. It's red, earthy, a little plum. It's not glorious, like his Marsanne or Edna Valley Syrah, but it's OK. I say this not to blast MaxTap, but to illustrate how hard it is to sell Syrah. "I was in Sacramento yesterday and visiting accounts, and everyone said, I love Syrah, I love your Syrah, but we're having a hard time selling Syrah, so I'd like this MaxTap (for) by-the-glass," Lindquist says. Roussanne is an even harder sell; at least people know what Syrah is. "My sales manager says with Roussanne, (sommeliers) say they can't sell it, but they buy a 6-pack to take home for themselves," Lindquist says. I believe it. I like a lot of Qupé's wines, and his 1999 Bien Nacido Syrah was glorious at this event, but the Roussannes were the find of the day. He ferments them in 1-year-old Burgundy barrels, and that adds an interesting effect to the young wines that disappears over time. Lovely to drink, with a sensuous, honey mouthfeel that lingers. Aromatically it gives cantaloupe skin, and there's some cantaloupe on the palate, along with a hint of the ashy taste of age, but this is not a fruit-driven wine, and that's the joy. It's sumptuous, luxurious, without being heavy. At an interesting stage of development, seven years in, with flavors and aromas of beeswax, and a texture like dry honey. Not as luxurious as the '03, yet. Who thinks that you're robbing the cradle with a 7-year-old California white? Here's the advantage in tasting all of these wines together, in context. The aroma of this wine is very white Burgundy-like, perhaps because of the barrels: toasty, leesy. Without putting it in your mouth, you might guess Chardonnay. Only when you drink it do you taste the beeswaxy Roussanne flavor, with some gravelly mineral notes. It's balanced, not fruit-driven, and now that I've had its predecessors, I realize I drank it too young. Order it here, and try it in a decade. Bob makes a great Roussanne and glad he convinced us to plant Roussanne at Truchard back in 1998. It ages quite well going back 5 to 8 years. Good to see there is a good buy in Roussanne. I have always found that this is a "weird" variety. Sometimes I get melon on the palate, but much of the time I find it bitter and having a finish of dishsoap (maybe it is me). I will stop by on my way down next time and see what they have in stock. Roussanne is generally considered to be an age worthy Rhone white. No reason a well made CA, cooler climate wouldn't either. I find the Rhone DTC enthusiast market to be quite solid, and we don't have very much planted in CA, and even less in cooler regions, for those who aspire to do a more Northern Rhone St Joseph/St Peray/ Hermitage Blanc style. Qupe does and exceptional job, IMO, with Roussanne, as well as their Marsanne. in retail when I am on sales floor, I always try to intro the white Bien Nacido Cuvee, half Viog and half Chard, to get a start for Qupe brand among white drinkers.